JKPSC Lecturer Recruitment 2018: The Government of Jammu and Kashmir requires experience or Freshers and working staff member for the various posts. The Jammu and Kashmir Public Service Commission has been published an employment notice through JKPSC Lecturer Recruitment 2018 Notification. The interested candidate can complete their Application process on or before the last date 20th September 2018. It is an opportunity for those candidates want to make a career in the PSC Jobs in the Jammu and Kashmir State. In this article, we are given information on JKPSC Lectuere (10+2) Vacancy 2018 like Name of Posts, Number of Vacancies, Last Date of Application, a method of applying for an Application Form, Official website Link. Firstly the candidates go to the official website of JKPSC. Click on “Recruitment” button and select “Online Form” options. Now Search “Direct Recruitment Posts” link and click on “Shows Jobs” button. The New candidate completes your Login process. Already registered candidate enter Registration Id, Password. Now Click on Lecturer Apply link and Application portal will be open. Remarks: Those candidates want to check all information About JKPSC Lecturer Recruitment 2018 and we are providing the latest update related to upcoming Recruitment on our website that is www.jobs.chekrs.com. 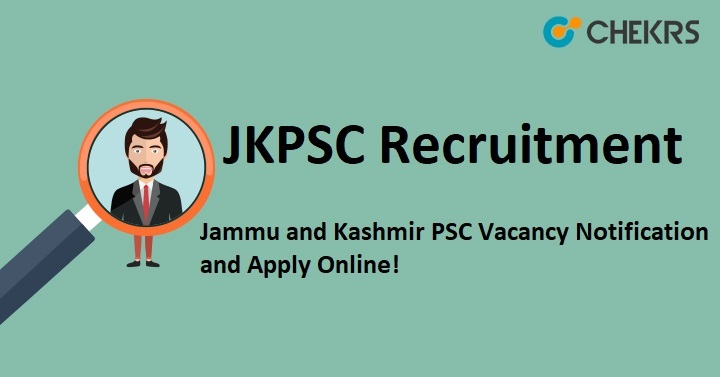 If you have any query about JKPSC Recruitment that you can write comments on commenting box and take a review or feedback.